While Target’s barriers come from their circular logo motif, the Tommy Ball originated from combination of Tommy Car Wash System’s distinctive circular arches, rolled acrylic roofing, starburst patterns, and circular vacuum arches, culminating in the red plastic sphere. What has come to be known as the “Tommy Ball” is literally intended to look like a big, colorful, plastic soap bubble sitting on the ground around the car wash—and people love it. In fact, when multiple locations are set up in an area, it’s the red or blue balls that have proven their value in tying the brand together in customer’s minds. Noting the positive effect the colorful barriers had, the Tommy Car Wash System’s team set out to adapt the idea for our own corporate washes. However, with affordability and ease of installation as important corporate values, the team decided that instead of using concrete as a design material, we would invest in something lighter, cheaper, and more manageable. Today, Tommy Balls are made from durable, weather-resistant plastic which can be filled with sand or other methods to secure in place. A flat bottom prevents the sphere from rolling, but they can still be moved to wherever a car wash owner wants them. Of course, we’ve come up with very effective places to install them around the wash site. Placing these brightly colored solid balls in creative ways by a car wash’s curb is a fantastic way to draw attention to a wash and make it easily identifiable. For impulse buys like car washes, visual identity is key and customers are far more likely to remember to refer their friends to “the car wash with the red balls outside” than they are to remember the wash’s exact name. The big problem with loading in a car wash is AIM. Old style chain and rollers required the customer to land precisely inside the tire track, and even new belt conveyors can be tricky for those who haven’t used them before. That’s why self-loading modules are designed to give drivers a hand, using mirrors, signals, and other cues to guide drivers in safely. Today, Tommy balls are an important part of that system too. Simply place a Tommy ball on either side of the conveyor to provide reassurance and guidance for drivers as they cruise on in. They carry on the theme, look inviting, and offer a good visual boundaries. Many car washes use cones or sawhorses to direct traffic when lanes are shut down or maintenance needs to be done. Yet traffic cones are visually associated with negative environments such as construction sites and accidents, and sawhorses and other makeshift barriers look unprofessional. Thankfully, you can do better. Using mobile, lightly weighted Tommy balls in place of traffic cones efficiently drives traffic without a negative emotional impact. They are easy to move, cheap enough to risk as barriers, and definitely big enough that motorists will see and respond to them. Instead of using standard, ugly 55 gallon trash cans (or worse—dumpsters) for a wash that should look beautiful and professional, why not disguise your trash and liven up the area with Tommy balls? Instead of being an eyesore, the balls configured with trash containers enhance the wash’s exterior, and create a more complete aesthetic. Why not incorporate the fun ball design into your wash’s outdoor landscaping? Tommy Car Wash Systems has red balls customized to be used as outdoor planters, allowing car wash buildings to combine modern design with their natural landscaping. The design uses the same opening as the trash cans but is filled with dirt and the desired flowers. These planters can be used for decoration or as traffic cones as described earlier. Have any other idea for Tommy balls in the car wash? Want to see how the rest of the system ties together? Give our sales team a call today at (616) 494-0411 to talk about your car wash needs and ideas. 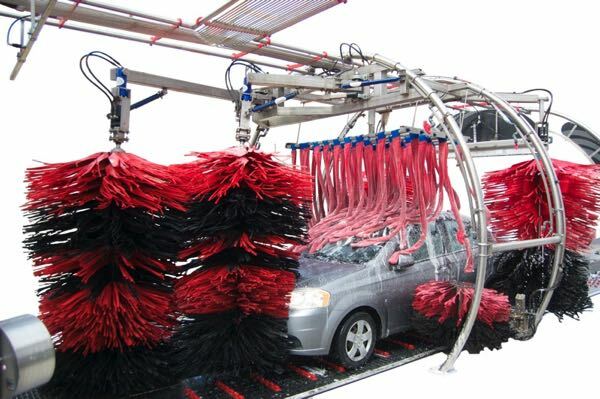 We have the car wash development experience, the equipment, and the car wash architectural designs you need!